“Calafate” redirects here. For the Patagonian town, see El Calafate. Berberis (/ˈbɜːrbərɪs/), commonly known as barberry, is a large genus of deciduous and evergreen shrubs from 1–5 m (3.3–16.4 ft) tall, found throughout temperate and subtropical regions of the world (apart from Australia). Species diversity is greatest in South America and Asia; Europe, Africa and North America have native species as well. The best-known Berberis species is the European barberry, Berberis vulgaris, which is common in Europe, North Africa, the Middle East, and central Asia, and has been widely introduced in North America. Many of the species have spines on the shoots and along the margins of the leaves. The genus Berberis has dimorphic shoots: long shoots which form the structure of the plant, and short shoots only 1–2 mm (0.039–0.079 in) long. The leaves on long shoots are non-photosynthetic, developed into one to three or more spines:96 3–30 mm (0.12–1.18 in) long. The bud in the axil of each thorn-leaf then develops a short shoot with several normal, photosynthetic leaves. These leaves are 1–10 cm (0.39–3.94 in) long, simple, and either entire, or with spiny margins. Only on young seedlings do leaves develop on the long shoots, with the adult foliage style developing after the young plant is 1–2 years old. Many deciduous species, such as Berberis thunbergii or B. vulgaris, are noted for their attractive pink or red autumn color. In some evergreen species from China, such as B. candidula or B. verruculosa, the leaves are brilliant white beneath, a feature valued horticulturally. Some horticultural variants of B. thunbergii have dark red to violet foliage. The flowers are produced singly or in racemes of up to 20 on a single flower-head. They are yellow or orange, 3–6 mm (0.12–0.24 in) long, with six sepals and six petals in alternating whorls of three, the sepals usually colored like the petals. The fruit is a small berry 5–15 mm (0.20–0.59 in) long, ripening red or dark blue, often with a pink or violet waxy surface bloom; in some species, they may be long and narrow, but are spherical in other species. Some authors regard the compound-leaved species as a separate genus, Mahonia. 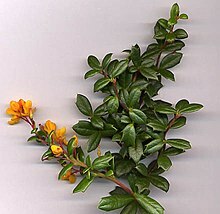 There are no consistent differences between the two groups other than the compound leaves (true Berberis have simple leaves), and most studies suggest that the two groups should be combined. However, a recent DNA-based phylogenetic study retains the two separate genera, though after the removal of several Mahonia species into two newly-described genera: Alloberberis (formerly Mahonia section Horridae) and Moranothamnus (formerly Mahonia claireae). Berberis species are used as food plants by the larvae of some Lepidoptera species, including the moths Barberry Carpet Moth (Pareulype berberata), and mottled pug (Eupithecia exiguata). Berberis species can infect wheat with stem rust, a serious fungal disease of wheat and related grains. Berberis vulgaris (European barberry) and Berberis canadensis (American barberry) serve as alternate host species of the rust fungus responsible, the wheat rust fungus (Puccinia graminis). For this reason, cultivation of B. vulgaris is prohibited in many areas, and imports to the United States are forbidden. The North American B. canadensis, native to Appalachia and the Midwest United States, was nearly eradicated for this reason, and is now rarely seen extant, with the most remaining occurrences in the Virginia mountains. Some Berberis species have become invasive when planted outside of their native ranges, including B. glaucocarpa and B. darwinii in New Zealand (where it is now banned from sale and propagation), and B. vulgaris and green-leaved B. thunbergii in much of the eastern United States. Several species of Berberis are popular garden shrubs, grown for such features as ornamental leaves, yellow flowers, or red or blue-black berries. Numerous cultivars and hybrids have been selected for garden use. Low-growing Berberis plants are also commonly planted as pedestrian barriers. Taller-growing species are valued for crime prevention; being dense and viciously spiny, they are effective barriers to burglars. Thus they are often planted below vulnerable windows, and used as hedges. Many species are resistant to predation by deer. Crispy Brussels sprouts with barberries on top at Zaytinya in Washington, D.C.
Berberis vulgaris grows in the wild in much of Europe and West Asia. It produces large crops of edible berries, rich in vitamin C, but with a sharp acid flavour. In Europe for many centuries the berries were used for culinary purposes in ways comparable to how citrus peel might be used. Today in Europe they are very infrequently used. The country in which they are used the most is Iran, where they are referred to as zereshk (زرشک) in Persian. The berries are common in Persian cuisine such as in rice pilafs (known as zereshk polo) and as a flavouring for poultry meat. Due to their inherent sour flavor, they are sometimes cooked with sugar before being added to Persian rice. Iranian markets sell zereshk dried. In Russia they are sometimes used in jams (especially the mixed berry ones), and extract from them is a common flavoring for soft drinks and candies/sweets. Berberis microphylla and B. darwinii (both known as calafate and michay) are two species found in Patagonia in Argentina and Chile. Their edible purple fruits are used for jams and infusions. The dried fruit of Berberis vulgaris is used in herbal medicine. The chemical constituents include isoquinolone alkaloids, especially berberine. The thorns of the barberry shrub have been used to clean ancient gold coins, as they are soft enough that they won’t damage the surface but will remove corrosion and debris. Berberis hybrid, with three-spined thorn (modified long shoot leaf) with leafy short shoot. Each thorn is 20 mm (0.79 in) long. Berberis hybrid, flower detail (flowers 7 mm (0.28 in) diameter). Berberis verruculosa, upper side of shoot above, lower side below. ^ English Names for Korean Native Plants (PDF). Pocheon: Korea National Arboretum. 2015. p. 371. ISBN 978-89-97450-98-5. Archived from the original (PDF) on 25 May 2017. Retrieved 26 January 2017 – via Korea Forest Service. ^ a b “Berberis fremontii in Flora of North America @ efloras.org”. www.efloras.org. ^ Flora of China Vol. 19 Page 715 小檗属 xiao bo shu Berberis Linnaeus, Sp. Pl. 1: 330. 1753. ^ Loconte, H., & J. R. Estes. 1989. Phylogenetic systematics of Berberidaceae and Ranunculales (Magnoliidae). Systematic Botany 14:565-579. ^ Marroquín, Jorge S., & Joseph E. Laferrière. 1997. Transfer of specific and infraspecific taxa from Mahonia to Berberis. Journal of the Arizona-Nevada Academy of Science 30(1):53-55. ^ Laferrière, Joseph E. 1997. Transfer of specific and infraspecific taxa from Mahonia to Berberis. Bot. Zhurn. 82(9):96-99. ^ Yu, Chih-Chieh; Chung, Kuo-Fang (2017-12-22). “Why Mahonia? Molecular recircumscription of Berberis s.l., with the description of two new genera, Alloberberis and Moranothamnus”. Taxon. 66 (6): 1371–1392. doi:10.12705/666.6. ^ “Biologists Spot First UK Case Of An Ancient Crop Disease In Six Decades”. ^ “RHS Plant Selector Berberis ‘Georgei’ AGM / RHS Gardening”. Apps.rhs.org.uk. Retrieved 2013-04-07. ^ “RHS Plant Selector Berberis × lologensis ‘Apricot Queen’ AGM / RHS Gardening”. Apps.rhs.org.uk. Retrieved 2013-04-07. ^ “RHS Plant Selector Berberis × media ‘Red Jewel’ AGM / RHS Gardening”. Apps.rhs.org.uk. Retrieved 2013-04-07. ^ “RHS Plant Selector Berberis × ottawensis f. purpurea ‘Superba’ / RHS Gardening”. Apps.rhs.org.uk. Retrieved 2013-04-07. ^ “RHS Plant Selector Berberis × stenophylla ‘Corallina Compacta’ AGM / RHS Gardening”. Apps.rhs.org.uk. Retrieved 2013-04-07. ^ “RHS Plant Selector Berberis × stenophylla Lindl. AGM / RHS Gardening”. Apps.rhs.org.uk. Retrieved 2013-04-07. ^ C. Tomlinson (1866). Berberis. Tomlinson’s Cyclopaedia of Useful Arts. I. London: Virtue & Co. p. 97. ^ “From the Trenches”. Archaeology: 9. July–August 2017. Murrills, Angela (2005-11-24). “Best Eating: Check, please”. Straight.com. Retrieved 2007-05-02. Wilkinson, Bobbie; Tom Wilkinson (2004-08-15). “It’s an Adventure in Persian Cuisine at Darya Kabob”. The Washington Post. Retrieved 2007-05-02. Arellano, Gustavo (2004-03-18). “Naan & Kabob”. Orange County Weekly. Archived from the original on 2007-10-10. Retrieved 2007-05-02.